We passionately believe that for something to be long-lasting, it should be built on a strong foundation rooted in being transparent and open. Unlike general outsourcing which focuses on short term project goals, we provide a long term solution similar to employment. With strong focus on building a long, transparent and open relationship between both the clients and talents. 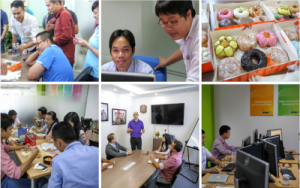 We are in the business of providing talents with the right attitude, expanding the talent scope of our clients, such that they are not limited by what is available locally- the world has plenty of talented people. By opening doors, we enable our clients to cherry pick top talents in places where there is abundant and affordable. At the same time we pave the way for top talents to find long term careers. What is the right attitude? Not only do we work with people who are experts in their field, but have the thirst to learn and continually improve themselves, challenge themselves to take initiatives and find innovative solutions. Someone with guts, not waiting to be spoon-fed but take real action towards progress. Someone who goes beyond mediocrity. We are in the business of saving cost for our clients, thus swanky offices, stylish furniture and fancy titles do not interest us. We started our company with our own savings, our first office was our 1 bed room 45sqm apartment in Sande, Norway. In a society where one is constantly pushed to conform, we know that we have gone against the current to create a service that is highly appreciated by our clients and employees. Our willingness to learn and improve ourselves have always triggered us to do our best and we will always try our best.